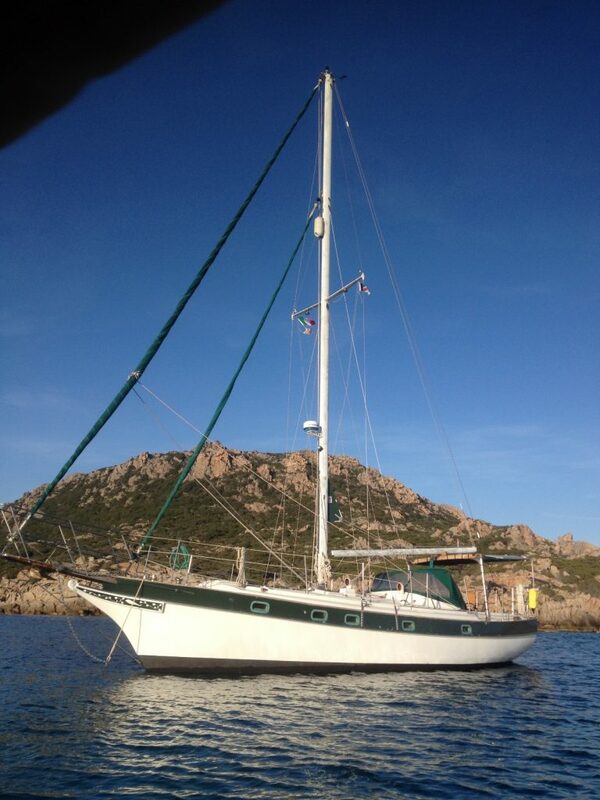 It’s crazy that after all this waiting I can finally write a post to announce that we bought a sailboat! It has been a long (sometimes exciting, sometimes painful) process as you can see in my last post, that has left us with some massive lows and one very big high. After seeing numerous boats that weren’t right for us we have finally found a boat we love, that we hope will take us around the world (or at least to the next marina!). 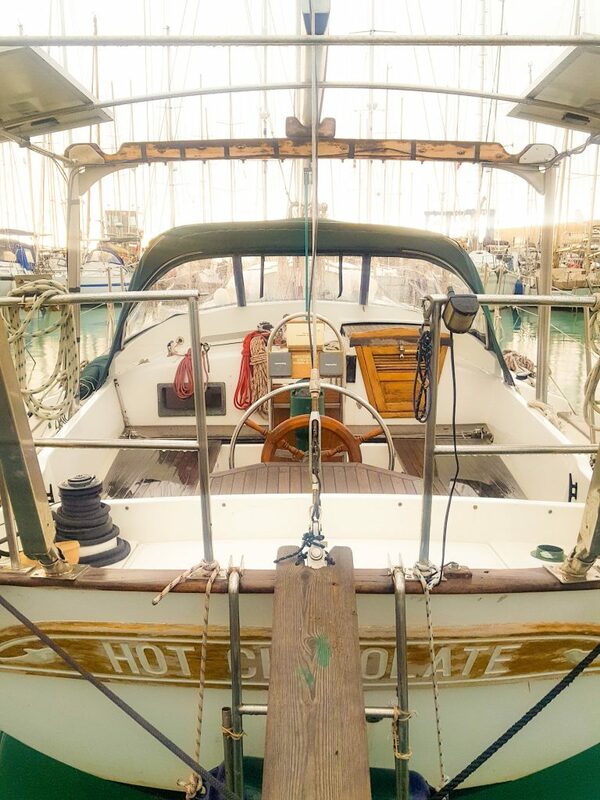 ‘Hot Chocolate’ is a Kadey Krogen 38, an American boat designed by Jim Krogen for his own personal use. There were 85 of them built and we are now the proud owners of number 76. 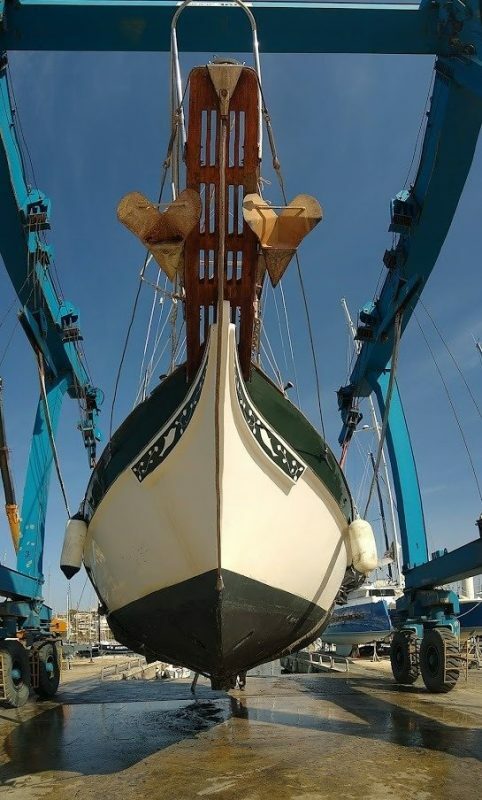 She’s floating at the moment and we’re hoping we can keep her that way! She will take quite a bit of work to get her back up to her former glory, but we knew that our budget wouldn’t stretch to a boat that didn’t come with problems and we’re excited to get to work. Kadey Krogen yachts have an interesting design. A very shallow full keel, meaning they can go shallower than a lot of sailboats, with tandem centreboards to help directional stability. We have loved speaking to other owners and finding out how passionate everyone is about them. It has also meant we have masses of knowledge and advice at our fingertips. We had a nerve wracking few weeks waiting for the survey. Luckily we found a brilliant surveyor who we can’t recommend highly enough. If you’re looking for someone professional, knowledgeable and with a great sense of humour then contact Mike at Salient Marine Surveys. Mike made the day fun and informative. We learnt a lot about the boat and boats in general (and he was sensitive when breaking bad news!) He told us of some biggish problems but also how we could fix them, and which jobs we would be able to complete ourselves to save money. Early in the morning Hot Chocolate was lifted out of the water by a gang of Italian men, shouting at each other angrily, gesticulating ferociously and doing everything they could to make me worried about the fact that I was standing on a 12 ton boat that was being hoisted out of the water. Once out she was given a good clean so Mike could see what he was dealing with. He assured us that he had all the latest surveying tech before pulling out a hammer and spending several hours tapping rhythmically at the hull. Just when I thought we had wasted several hundred pounds on a wannabe drummer, he explained that he was listening to a change in sound that indicates delamination. The rigging looked to be in good shape and the sails for Hot Chocolate have just been refurbished. We got to take a trip to the sail repair shop to see them which was fun. 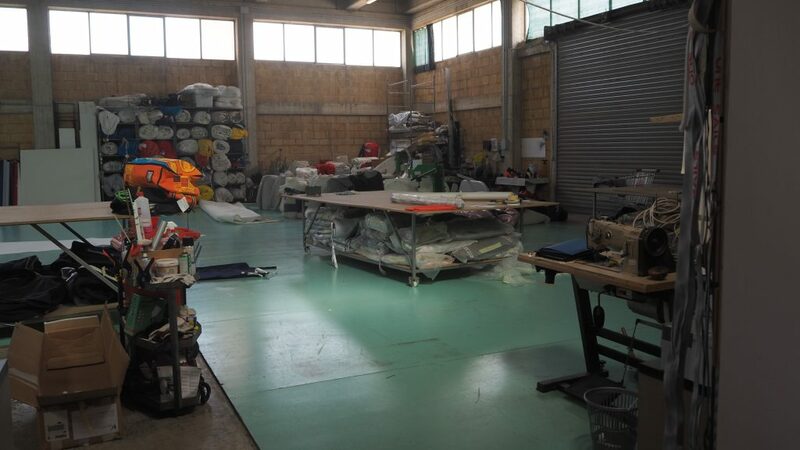 They have a MASSIVE warehouse full of sunken industrial sewing machines, and room to lay out our sails on the floor so we could take a good look. It does mean that until we get the sails refitted we’re going no where! Once back in the water he poked around inside for several hours (luckily narrowly avoiding Adam’s underwear drawer). He pulled apart joinery and ran the engine so hard I thought the boat would break loose from her ropes and plough into the expensive looking yacht opposite us. Luckily the very old engine seems to run fine, though I think Adam is already missing the massive Mercedes engine he had on boaty! Inside she feels like a home. Which is quite important considering we will be living on her! 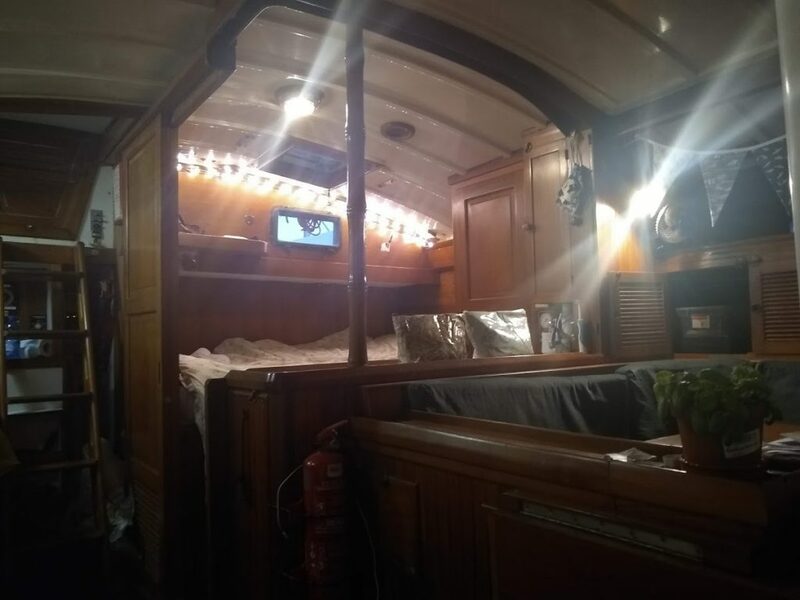 She has an aft cabin that can be open plan, making the salon feel roomy and meaning Adam has to get up nice and early like me because he wakes up when I clatter around making tea. That’s actually a lie, he just covers his head with a pillow and sleeps through. She also has a separate shower and toilet rather than a wet room. She has a broken oven that burns us every time we use it, the cosiest sofa to watch films on, a fridge we can’t get to and a window above the bed to watch the stars. I hate making decisions. Not even my Mum could make this one for me. After a full day of looking for problems (and obviously finding them!) we were physically and emotionally exhausted.